We supply you with a plethora of articles with landscaping tips. For most of us, however, a grassy lawn takes up the majority of our yard space. So today, instead of focusing on the gardens in the corner of the yard or the trees scattered throughout the yard, we’re going to focus on the facts about how you can mow your way to a nearly flawless lawn. First off, mowing height and frequency mostly determine the health of your lawn. Hopefully you already know that the height of your blade can be altered on your mower. Although many homeowners opt to cut the grass as short as possible in order to cut down on how often they must do the chore, the truth is, the grass is much healthier when you keep it longer. This is especially true for grass in hot climate or during a drought period. 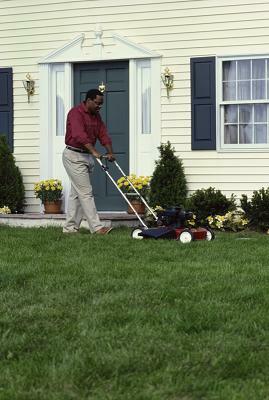 The height of a blade of grass should never be cut more than one-third of its total height in one mowing. The ideal height depends on the type of grass your yard contains, but typical height averages range between half to two inches long. Extra perk: By only cutting one-third of the lawn length at a time, you can usually leave the grass clippings on the yard without it looking bad. These grass clippings provide natural organic matter to the lawn, such as nitrogen, when they break down. That means less fertilizer needed and more natural nutrients for your lawn! If you have an open house or a gathering occurring at your house soon, collect the grass clippings in bags and distribute them on the lawn at a later date. How often you mow your lawn depends on the type of grass that your yard contains. If you live up north or in the Midwest, you most likely have a cool-season grass, such as bluegrass or fescue. These types of grasses should be cut to about two inches high, so when the grass is three inches long or more, cut it. If you live down south, you most likely have zoysia, buffalo grass or other types of warm-season grasses. These grasses can be cut to one-inch tall. On average, lawns should be mowed once a week, but obviously the actual frequency will depend on the weather and the health of your grass. When you mow, you should switch up the direction of your lines. This prevents the same grass from getting run over by the mower’s wheels during each mow. Side note: Be careful around trees and gardens. Constantly nicking a tree trunk can cause damage to the trunk and prevent it from properly maturing. Instead, leave the grass closest to the trunk uncut and go back later with a trimmer. Better yet, surround tree trunks with mulch to prevent the problem in the first place. Also trim around gardens, fire pits, patios and other hard objects that could nick the mower blade and cause damage to the mower and injury to yourself. How often should you water your lawn? Currently, numerous locations are dealing with water conservation issues that limit the amount of watering a homeowner can do. Consider installing an irrigation system that allows you to decide exactly how much water your lawn receives, when it receives it and where the water goes to. For more affordable options, purchase a lawn sprinkler, specifically for a lawn. Rotor heads will uniformly water your entire yard at the same time, spray sprinklers are good for when you have one patchy area of brown grass, and drip sprinklers deliver the water directly to the ground without wilting the grass. Watering and/or mowing early in the morning or in the evening is ideal, when the temperature is not at its hottest. Hopefully this information was helpful. Next time you host an open house or a party gathering, instead of spending hours sprucing up your gardens, spend time bragging about your healthy lawn! This is, after all, what takes up the majority of most yards.